This study has 10 sessions, incorporating an introductory session and 9 lessons. 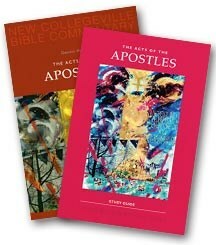 The Study Set includes a Study Guide by Little Rock Scripture Study Staff and the New Collegeville Bible Commentary, The Acts of the Apostles, by Dennis Hamm (Liturgical Press). Dennis Hamm, SJ, PhD, since 1975 has taught Scripture at Creighton University. He is author of the various journal articles and reviews, as well as the three-volume Let the Scriptures Speak, published by Liturgical Press (1999, 2000, 2001). Acts tells the story of the spread of the Gospel and the growth of the early church from its beginnings at Pentecost, following the ascension of Jesus. The Holy Spirit empowers the preaching of Peter, Paul, and the other disciples to take the faith from Jerusalem, to Judea, throughout Samaria and ultimately to the ends of the earth. It records the conversion of Paul and the momentous decision of the early church to welcome Gentiles as well as Jews into the church. Acts is the second volume of the literary work begun in the Gospel According to Luke.